The aloe vera plant is well-known for its applications in soothing skin-care products, but some byproducts of the plant are also used in traditional hair-care preparations. 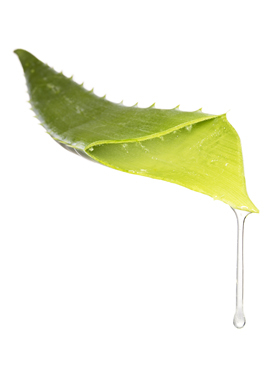 Among those byproducts is aloe vera juice, a fully liquefied version of the gel contained in the rigid leaves of the plant, which can be either consumed or used topically. Heals and Soothes Damaged Scalp from Scratches, Burns, Dandruff, etc. Because it is so deeply moisturizing, aloe vera juice is a popular therapeutic moisturizer for coarse hair, according to “The Black Hair Care Revolution” by Yetunde Jude and Betsy Bearden. The authors recommend using the most pure concentration of aloe vera juice possible to saturate clean and freshly rinsed hair, and allowing the solution to air-dry. If you have longer hair that would make air-drying awkward, braid your hair after conditioning, or put it in a ponytail with a metal-free ponytail holder. This is an especially helpful treatment for coarse hair that has been put under stress from heat, such as from hooded dryers or prolonged sun exposure, or from chemicals, like those used in chlorinated swimming pools and certain hair-care products. If you have a problem with persistently oily hair, aloe vera juice can be part of a simple and inexpensive rinse designed to dry out your hair without making it brittle, according to Sandi Brenner’s book “Beauty and the Budget.” Try mixing one part aloe vera juice with two parts lemon or grapefruit juice and working the mixture through your hair. The acid from the fruit juices will strip away excess oil without the harshness of chemicals, and the aloe vera juice will help prevent over-drying and keep your hair soft to the touch. Alternatively, add small amounts of both ingredients to your dollop of shampoo right before shampooing your hair. According to the Mayo Clinic and the National Institutes of Health, there have been relatively few clinical studies into the effectiveness of aloe vera juice in comparison with tradition-based claims of its capabilities. Among the theories that are time-honored but not yet scientifically verified is the belief that aloe vera juice can help reverse hair loss and re-grow hair. Case studies of this effect are detailed in “Aloe Vera: Nature’s Silent Healer” by Alasdair Barcroft and Audun Myskja, and this use is recommended in “Diets for Healthy Living: Dr. Linda Page’s Natural Solutions to America’s 10 Biggest Health Problems” by Dr. Linda Page. In the latter book, a blend of fresh, ground ginger and aloe vera juice are promoted as a topical hair-growth solution specifically for women who exhibit female pattern baldness after menopause. While science has yet to prove or disprove this claim, the Mayo Clinic states that moderate topical application of aloe vera is generally well-tolerated, with some exceptions for those with known allergies to garlic, onions, tulips or plants in the Liliaceae family. IN SA which is the best aloe vera gel/juice to use for my hair and where can I find it. I've got to clicks and dischem and they pointed me to the aloe vera juice that's flavoured for drinking and I don't think that's what we talking about here.